The defender initially took part in the Toffees’ warm-up at St James’ Park, but lasted only five minutes before being withdrawn. The 30-year-old put in an impressive display against Liverpool last weekend. 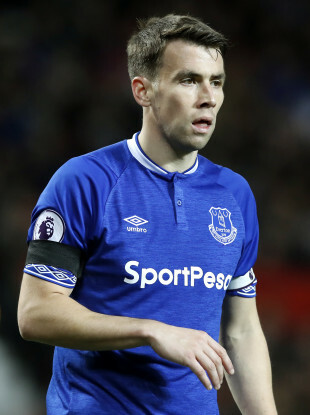 IRELAND CAPTAIN SEAMUS Coleman was forced to withdraw from Everton’s starting XI for today’s Premier League meeting away to Newcastle due to a late illness. The Toffees defender was named at right back by manager Marco Silva, but was forced out of Saturday’s game at St James’ Park shortly before kick-off. Coleman endured a frustrating start to this season, but has been back in form in recent weeks, picking up an assist during a 3-0 defeat of Cardiff while also impressing during last weekend’s Merseyside derby against Liverpool. The 30-year-old was named in Mick McCarthy’s provisional 38-man squad for this month’s Euro 2020 double-header away to Gibraltar and at home Georgia in two weeks’ time and is expected to start in both qualifiers. Coleman took part in Everton’s warm-up in Newcastle this afternoon, but lasted only five minutes before being replaced in Silva’s starting XI by Jonjoe Kenny at full-back — with Gylfi Sigurdsson taking the captain’s armband. 🔄 | Seamus Coleman now misses the game due to illness. 🔹 Jonjoe Kenny replaces him in the starting XI. 🔹 Tom Davies comes into the matchday squad. Email “Seamus Coleman withdraws from Everton starting XI before kick-off due to illness”. Feedback on “Seamus Coleman withdraws from Everton starting XI before kick-off due to illness”.